All galaxies are thought to have supermassive black holes at their center. These start out small—with masses equivalent to between 100 and 100,000 suns—and build up over time by consuming the gas, dust, and stars around them or by merging with other black holes to reach sizes measured in millions or billions of solar masses. 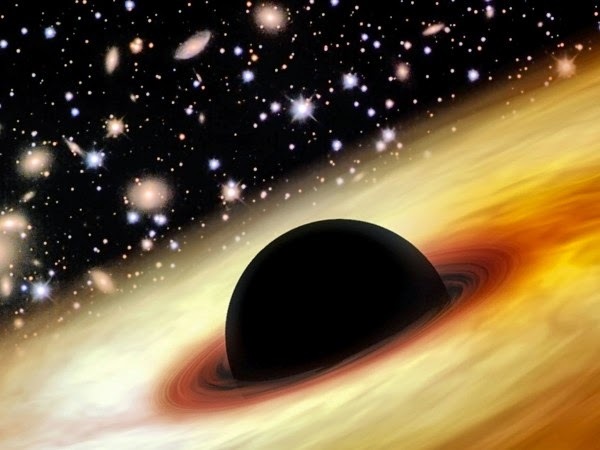 Such binge eating usually takes billions of years, but a team of astronomers was stunned to discover what is, in galactic terms, a monstrous baby: a gigantic black hole of 12 billion solar masses in a barely newborn galaxy, just 875 million years after the big bang. The researchers report online in Nature today that they were scouring through several astronomical surveys looking for bright objects in the very early universe called quasars, galaxies that burn very bright because their central black holes are consuming material so fast. The monster they found (depicted in this artist’s impression) is roughly 3000 times the size of our Milky Way’s central black hole. To have grown to such a size in so short a time, it must have been munching matter at close to the maximum physically possible rate for most of its existence. Its large size and rate of consumption also makes it the brightest object in that distant era, and astronomers can use its bright light to study the composition of the early universe: how much of the original hydrogen and helium from the big bang had been forged into heavier elements in the furnaces of stars.